On February 25th, Warren Buffett was interviewed at length by CNBC. I only saw highlights of it, but there was some very interesting conversation regarding banks. As many of you know, we at TTCM have been bullish on banks for the last decade, since they were recapitalized during the Financial Crisis. What is not appreciated by most market participants is that banks in the United States are safer than they have ever been. They have doubled their capital ratios and liquidity reserves. It would take a recession as big, if not bigger than the Great Recession, to see any real annual losses for the big banks in particular. Loan losses would go up but their pretax income is so high before provisions, that it is a real challenge to get them to realize losses on a given year. Because they have less leverage, they also won’t post 30% returns on equity like they did prior to the Financial Crisis, but we think that is healthier anyways for all involved. So if we have these money-printing machines that have some similar characteristics to utilities nowadays, what is the appropriate price? In a world where the 10-year Treasury yield is less than 3%, these companies are worth a heck of a lot more than book value. 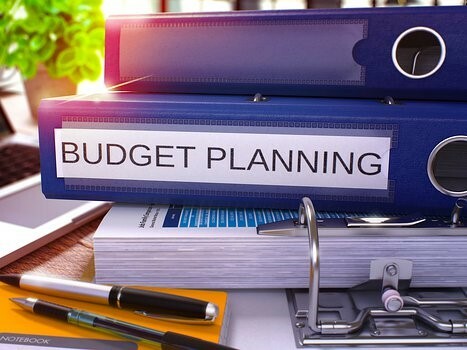 At a 15% return on tangible equity, a valuation of 3 times tangible book value would result in an earnings yield of 5% , which is over 40% more than the return on the 10-year Treasury. Clearly, the 10-year Treasury is safer, but what premium is warranted? 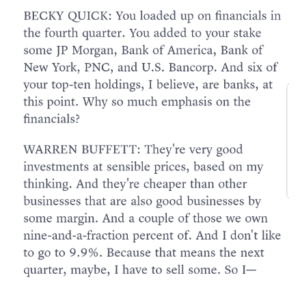 Buffett is saying that it should be much less than current prices reflect for banks. Many of the banks we own trade at discounts to book value, which makes the math even more compelling! 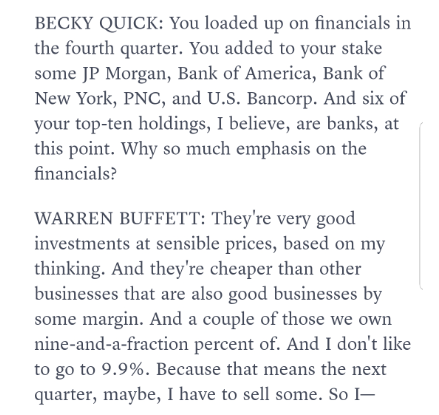 Banks improved risk/reward characteristics are why they are the largest component of Berkshire Hathaway’s investment portfolio. Buffett added aggressively in the 3rd quarter at higher prices than what are on offer today. We added materially in the 4th quarter when prices got dramatically cut, offering a stellar opportunity to make money. The banks are somewhat unique in that it would take a truly disastrous economy for them in aggregate, to post major losses. There can be one-offs here and there, especially for smaller regionals. The same math does go for many of our insurance and specialty finance positions too, in that they are substantially undervalued in the current market. This is one big reason that we are optimistic on future returns, despite our belief that the overall market is unlikely to do anywhere near as well as it has over the last 10 years, coming out of the recession.